We arrived on time at 9am, and I was a bit worried about the size of the guys I was going to be competing against. I looked the smallest height wise and was giving away a lot of weight to most of them. As people turned up I saw a fellow Cornishman, James Bush, and even though we were similar weight, he made me look small. We both weighed around 105kg, so at an open competition, we were a fair bit lighter than the other competitors. The first event was the Appollon's Axle, which I have never tried, although I have a scaffold bar which rotates. I used a belt clean and split jerk on every weight. The first weight was 95kg, and went up easily. On the second weight 105kg, my wrist wrap came undone, but there was no drama. On the next weight, 115kg, my wrist wrap again came undone, and caused me to have to grind it out. The next weight was 120kg, and it went up easily. 125kg would be an overall overhead PB. I cleaned it but it did not sit right. I went for the jerk twice, but I didn't quite get it. 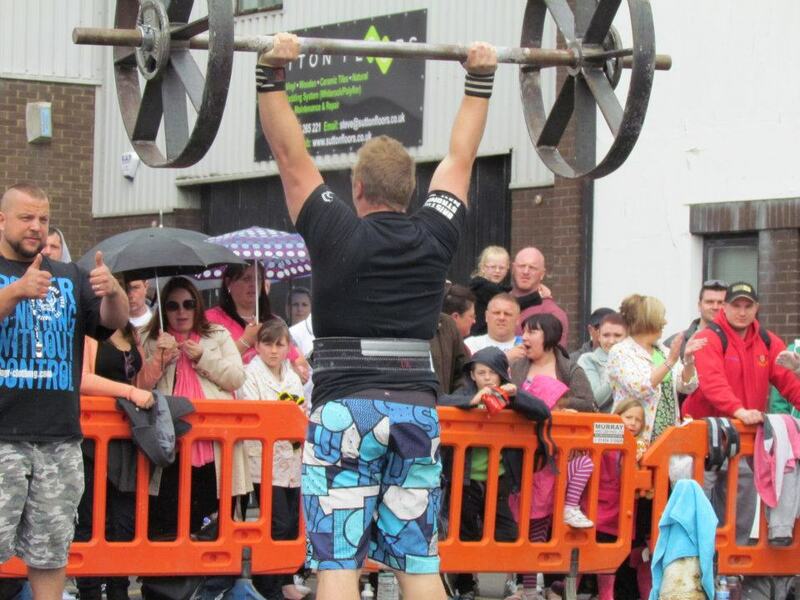 Two competitors managed to lift the 125kg, but then they both failed the 130kg. Joint 2nd for me. 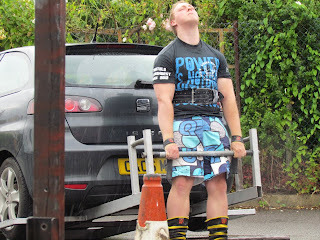 The next event was 110kg farmer’s, with a low pickup, and 260kg super yoke, both for 20m. I watched lots of guys struggle with this event. I picked the farmer’s up, and built up some speed, went straight onto yoke, and built up some speed, but just didn't want to make a drop. I believe that my time was 30.2 seconds but I was beaten by about one second by someone who completed the course in around 29 seconds. Another 2nd place for me. The next event was a car deadlift. This was an event that I was looking forward to, but I was told that there was a competitor with a 360kg deadlift, and was a world powerlifting competitor. Anyway for some reason I was placed before him in the order. I am not sure why, but I had watched competitors lift the weight for 8 reps, 9 reps, and one guy managed 15 reps, although some competitors really struggled. I pulled 16 reps, asked how many reps I had lifted, and then decided to leave it at that. The powerlifter was next to lift, and pulled 19 reps. 2nd again for me. The next event was a block press. 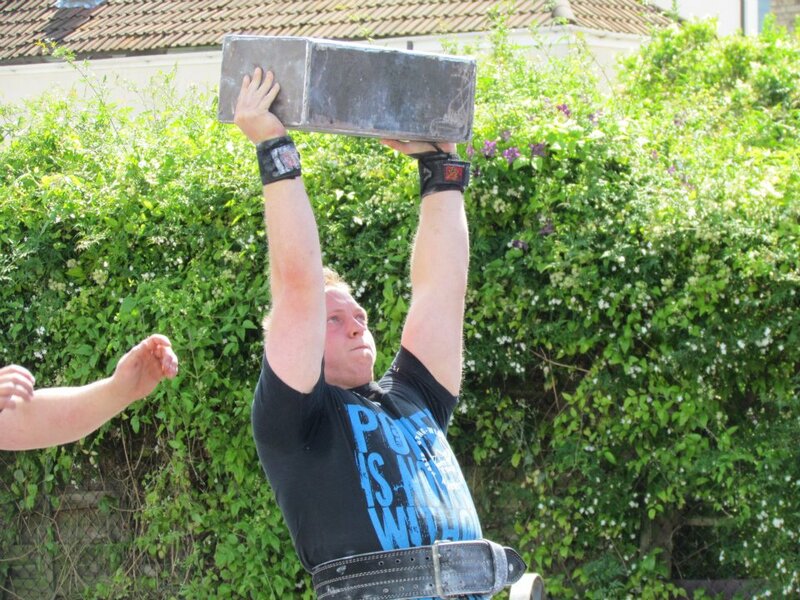 This was 90kg, but it was an extremely small and dense metal block, which made balancing it very awkward, so many people with massive pressing power were failing at this lift. A couple of guys lifted it for 1 rep, then Tom (superman) lifted it for 4 reps. I lifted it for 2 reps, and went for a 3rd, grinded, and missed it, put it down, and re-cleaned it. I managed a 3rd rep, and then time was up. 2nd place once again. 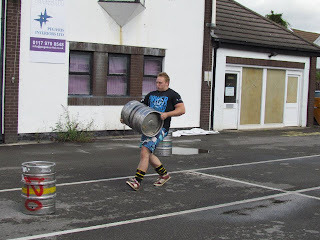 The final event was keg loading, which involved carrying a 60kg keg from 20m over a yoke approximately 48inches high, then running back to a keg that was 15m out, weighing 90kg, running that in, running back 10m to a 100kg keg running that in, and finally a keg 5m out weighing 120kg, and running that in to complete the course. 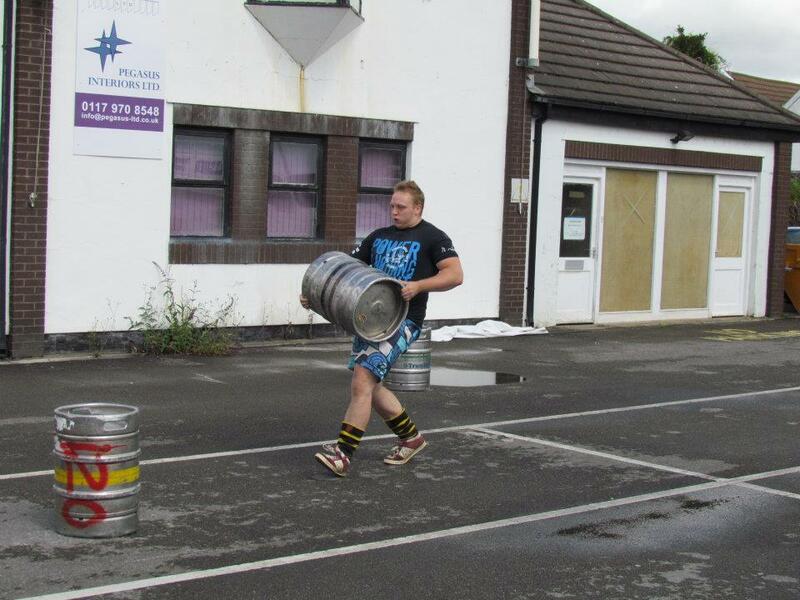 Lots of competitors were gassing out on this event, but I watched Tom (superman) basically sprint with most of the kegs. He completed the course in 48 seconds. I knew that if I could place behind him, I would win, as at this point, I was 2 points ahead. I used the one at top one at bottom technique, where as everyone else placed them high on their chest, and both hands at the front. Tom's height definitely helped him on this event. Anyway, I completed the event as fast as I could, in a time of 45 seconds. 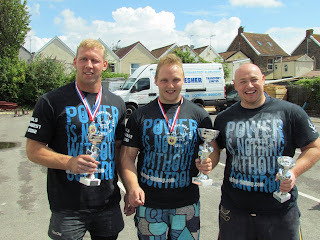 It was my first event win, and won me the overall 1st Place [Happy], and Bristol’s Strongest Man Title. Like I said at the start, I was very surprised. I never expected to be competitive, especially having stepped up to 105kg competitions this year. Another amazing day, that I will always remember. I am so happy that I got my first competition win. Thanks to Darren and Matt for driving me, Laurisaa for support even in the rain. Dan, Olly, and Joe for running the comp and Pumpking Supplements for sponsoring prizes and VikingR for the t-shirts.